Now DJs and mobile entertainers can add the visual excitement and impact of gobos to any event even when power outlets aren’t readily accessible, thanks to the new EZgobo projector from CHAUVET DJ. Battery powered and wireless, the new LED product brings an unprecedented level of mobility to gobo projection. Another “nice thing” about the EZgobo is that it allows DJs to create their own removable gobos with transparency film (purchased separately) . The new mobile gobo projector also has ten built-in wedding ready gobos that are ideal for many ceremonies. 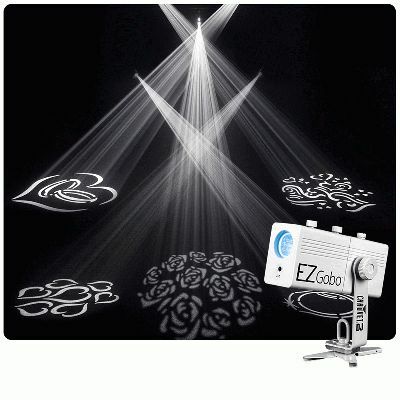 Adding to the flexibility of the EZgobo is its manual zoom, which allows short or long throw applications. With a 10–watt single cool white LED light source that has a 50,000 hour life expectancy, the EZgobo delivers the durability and output expected of a high-quality DJ fixture.